Hey, I just thought it would be cool if we were able to record 60FPS gifs. Improvement of the software, thank you! 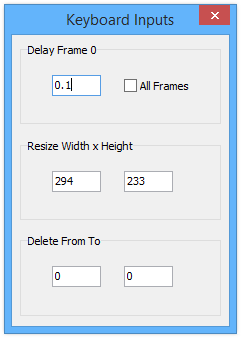 If a “Edit” menu has “the deletion of this frame and frame delay increase just before that”, I am glad. I delete parts of the few change by green screen and, by the operation mentioned above, lower the frame rate partially and can compress a file. Because I am not a human being of the English zone, I’m sorry if it is hard to understand the expression mentioned above. I understand that I can do it by a conventional function. But I am glad for me when a shortcut enables operation to be of showing it below. [Captured frame] is expressed as [Contents, delay time]. I think that it is difficult I drag delay label, and to set it. I don’t know, this my confuse users..
maybe I will add a simple preference option like “increase delay when deleting frame”. Any chances of Webm export in the future? Exporting to Webm requires adding some encoding files with gifcam.exe, and that wouldn’t make Gifcam single, lightweight and portable application, I choose to add “Export to avi” format, because avi format is part of windows system, that feature depends on avifil32.dll file which comes with all windows versions. Hello, and nice work with this program! I just had a question about one thing – when I record a scene and export to AVI, the playback of the clip as an AVI file is extremely fast, and some clips have a weird, messed up line of brightly colored pixels at the bottom of the video. Did I do something wrong and is there a way I can fix it? I forgot to mention, this was with recording 33 fps. Another thing I noticed is that some clips will only be partially recorded, and then show a frozen frame the rest of the way. avi format (and video format in general) has only one fps rate, on the other hand gif format has delay between frames (while recording gifcam adds delays when no change happening in the recording area) , so when exporting to avi with 33 fps, the AVI playing rate would be fast. maybe a good solution for the next update is to set the avi fps as average of all frames delays. – gifcam “export to avi” depends on windows avifil32.dll file, maybe this file is corrupted or there is codec conflicts on your machine. I have this same problem – I export to avi, and my video has only been partially recorded and is stuck at a frozen frame the rest of the way. It is quite frustrating, because Gifcam is perfect otherwise! Hi Isa! Gifcam is really great. I was looking for an app like that in a while. However, it does not work well with me no matter what version I download. Everytime I record a gif it never record to the indicated dimension of the window and you can see the window in the gif :(. GifCam.exe/Properties/Compatibility/Disable display scaling on high DPI settings. How could I download the 5 version? No problem with the link, It gives gifcam version 5, I guess you are on Windows XP, Windows XP doesn’t support “split button” natively so right click on the Save/Rec buttons to get the options menu. any update for when it will work with Windows 10? 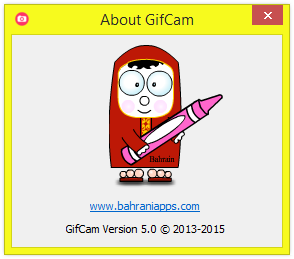 Nothing specific for Windows 10 but maybe I will submit gifcam to Windows store when they start accepting desktop app. I’m running gifcam on windows 10 and I haven’t seen any compatible problems, alos gifcam is native Windows application, it adapts automatically to windows 10 style and theme. Before I start let me say this program is a god send. I love it, but I’ve updated to Windows 10 and its doing the “not capturing the right area” thing and I’ve done the “disable dpi scaling” but the problem still exist. Any advice. PLEASE change the memory allocation from an INT to a LONG. By having it as an int, you can only store 2GB max to memory (2,147,483,647). I have 16GB ram on my computer, and I really want to use it to make super long GIFS. Besides that, this program is amazing. I really hope you can do this change soon! I would think it would be pretty simple. Thank you Riya :) glad Gifcam eases your gif making process. Let me say thank you for contributing this awesome program for us! I’ve been using this for two years and I’m very happy with it. I just wish one can add watermark to a gif on the corner of the gif. You see it would be helpful in tumblr as gifts with no watermarks are stolen by other bloggers all the time. Adding watermark is good idea, for now you can add text across all frames, but to make it right watermark has to blend with the frames with some semi-transparent text, I will try to work on that. i have a problem where it will record and save as AVI, but when i import the frames to photoshop i find that many of the frames are the exact same, so almost every other frame is the same as the last one. do you know how i could resolve this? also just thought i’d mention i don’t think it’s to do with my laptop, i think it’s the actual program, as when i click edit (before exporting) the greenscreen shows that some frames are the exact same.. Thanks for this greap program. I have a question though. Is there anyway to get a better quality when making a gif? I’m using quantize but I still feel there is a loss in the quality and would like a better one, maybe higher bitrate. The loss of quality is because gif file format has a limitation of 256 colors for each frame, if the frame has more than 256 colors then a color reduction algorithm should be applied. How am I able to delete a number of consecutive frames(example: Frames 5-10) without right-clicking each frame and delete it one at a time? I saw Keyboard Inputs -> Delete From/To, but I don’t know how to activate that option when I typed in From  To . dude can is there a way to increase the limit of 2GB?